In Q3 2016, Sprout’s reporting squad launched a variety of new reports and revamped several others. The team implemented design tweaks for a better user experience, updated metrics for data parity, introduced new dynamic charts and data visualizations and added even more data to better meet users’ needs. Here’s a look at some of the ways Sprout’s Reporting tools enable brands to make more informed business decisions. The Tag Report provides teams with a summary of inbound or outbound messages tagged from Compose and the Smart Inbox. This provides insight into message volume, brand sentiment, campaign success and subject matter. To build on the report’s core functionalities, the reporting squad rolled out two additional charts. 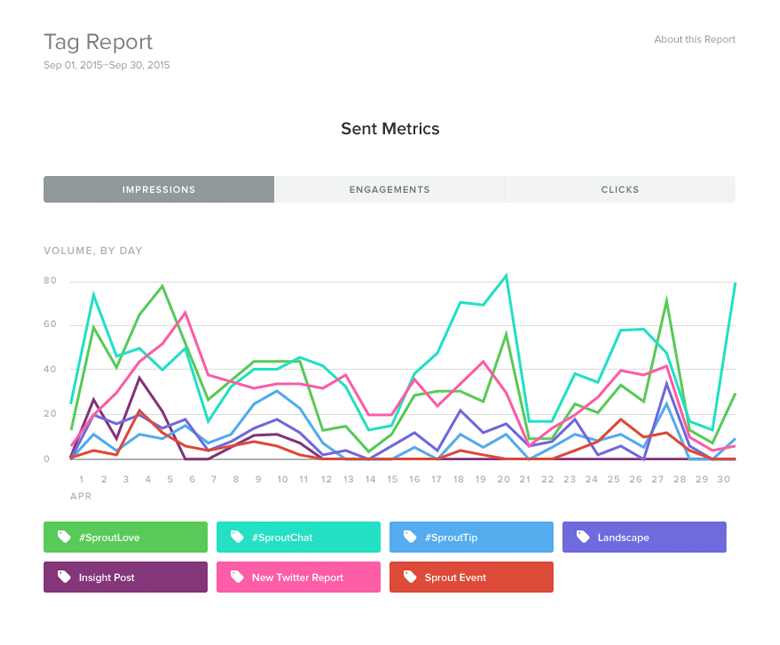 The Sent Metrics chart enables users to understand the volume of engagements by tag. In particular, when using campaign-specific tags, the chart helps visualize which campaigns received the highest engagement over time. 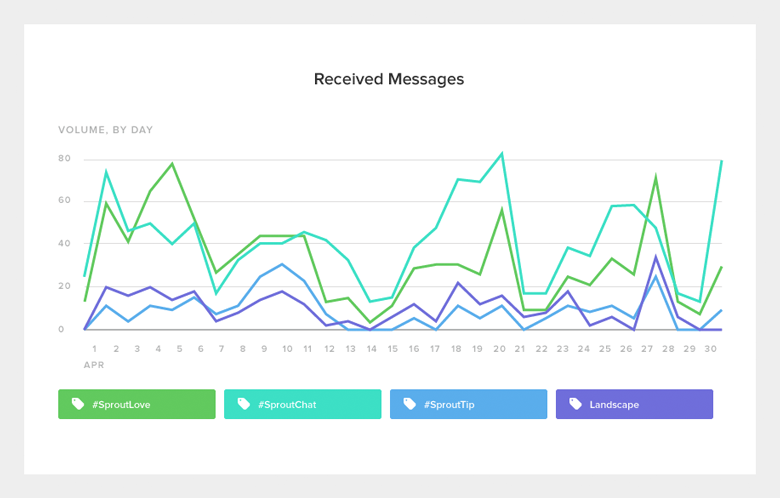 The Received Metrics chart enables users to understand the frequency of tags used together. In particular, when using sentiment based tags, the chart helps visualize sentiment by tag over time. The Team Report allows brands to better evaluate individual social agents with reply metrics across Twitter, Facebook and, most recently, Instagram. Our reporting squad understands that not every brand offers social support only during standard, Monday through Friday 9:00 a.m-5:00 p.m, business hours. To help brands analyze efforts according to their working hours, we’ve added a Report Setting that enables account owners and managers to configure business hours at the profile level. Once the business hours are set, managers can use the report to measure response times of their agents while the profile is “open” for business. Single global profile: Monitor response times of local agents within the profile’s business hours. 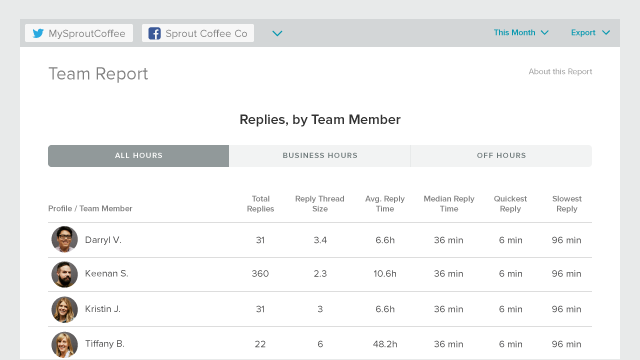 Use the On/Off Business Hours filter to track response goals and reply thread size. Multiple profiles segmented by country: Configure business hours specific to each time zone and the hours of operation of individual profiles. 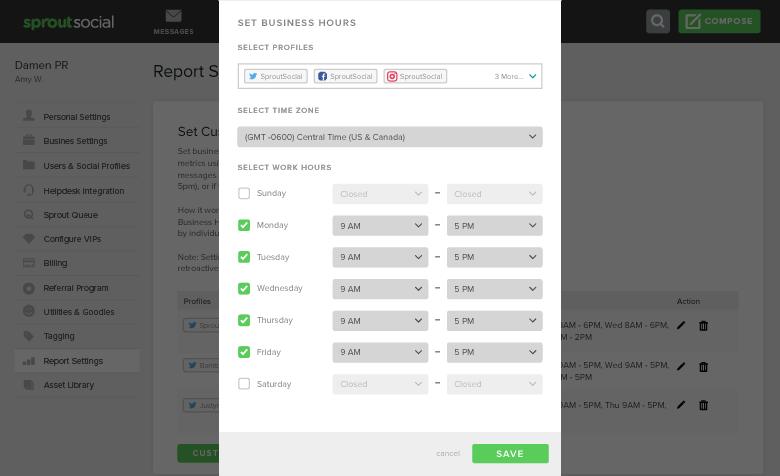 Use the On/Off Business Hours filter to track agent response metrics. We’re always looking for ways to improve our existing data and provide access to new information. Facebook metrics such as click breakouts, video views and Reach added to the Sent Messages Report. Additional metrics added to the CSV exports on our network reports. Design enhancements to charts and report detail including custom logo additions on the PDF exports and color scheme updates for parity. Stay tuned for more reporting updates and sound off in the comments if there are any in particular you’d like to see.